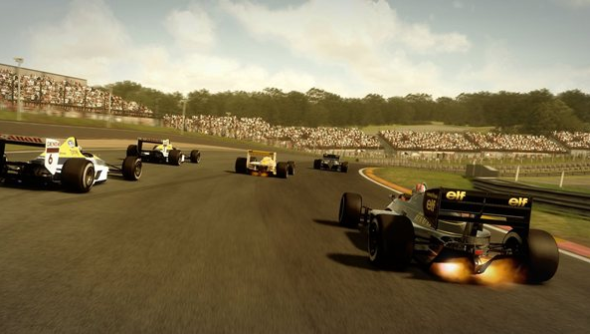 F1 2013 is out now; here’s our F1 2013 review. Not that good at racing games? Well, turns out you could get the advantage over other racers in F1 2013 by simply running the game at a higher frame rate. It made the cars go faster and have better lap times than their slow-framed competitors. No longer, though. The latest patch fixes the issue. Mostly. Another change to limit the issue is setting a maximum frame rate of 120fps. It won’t solve the problem but it will reduce the advantage possible. When creating a game, there is now an added option in the race settings: “Downloadable Content Tracks “On / Off”. If you turn this to ‘Off’ any players who don’t have DLC installed will be able to find & join your game – that means opening up the ability for Classic/DLC players to play against standard edition players. We’ve made improvements to the PC FPS issue whereby higher specification PC’s had a considerable lap time advantage over lower ones. Although we haven’t yet fully rectified the issue completely across all tracks, we wanted to get these improvements out as soon as possible whilst continuing our investigations to see where further improvement can be made.We have also introduced a frame rate cap at approximately 120 frames per second to limit the extremity of the variation at exceptionally high frame rates. We are confident this change will not result in any visual degradation, and will further prevent the issue being exploited and allow for fairer competition online.We would encourage players to test this in multiplayer races rather than solely relying on AI lap time benchmarks, as there is variation deliberately built into the latter for gameplay reasons. We are aware this is a hot topic and will continue to monitor the forums for feedback once this fix is live. Including cases of incorrect track initialisation, race logic, set ups and crashes. AI will also no longer pit to change tyres when re-loading from a Mid Session Save. Thanks to the feedback we’ve found a couple of issues related to car wheel positions which we now have been addressed. If you are experiencing any other instances where the AI seem too early on the brakes / too slow into a corner, please let us know the track & corner number and we will investigate. This was allowing players to use their DRS in non-valid areas. The leaderboards will be reset as a result. Updated the Tyre compound choice for Korea, Japan & India to reflect the 2013 season. Added functionality to view gamer card / profile on results screens. The race director will now be available in co-op if the one player retires from the season in qualification or practice. Changes to audio mix volumes while on track. Steam Achievements are now visible / displayed correctly. Resolved an issue where a lobby would incorrectly show as being full. Fixed a network issue where AI would not receive penalties correctly at the end of a race. Fixed an occasion where AI cars could exit their box into the pit lane too fast. Turning collisions off will now also disable the safety car. Changed the car lighting on Yas Marina during the night. Fixed a crash relating to a vote to end a session with players that have joined in progress. Audio Memory changes, so there should be no audio dropout after longer durations of play / sitting on the pause menu. McLaren Cockpit view texture update. Updated collision boxes on the Williams FW14B & the Ferrari F92A. Updated collision audio, and fixed some cases of audio drop out. Resolved an issue in Split Screen where the player ones camera could slightly flicker. Resolved an issue where the skipping to day 2 of the Young Drivers Test would make the day 1 hairpin test very difficult to complete. Fixed some instances of the auto drive not releasing the Ferrari 312T2 correctly. Removed Tweak in from the Fanatec Clubsport wheel, updated the Logitech Wingman Formula GP Wheel action map.